New York-based saxophonist PATICK CORNELIUS previews the London album pre-launch of , Infinite Blue (Whirlwind) at the 606 Club. Monday April 22nd. 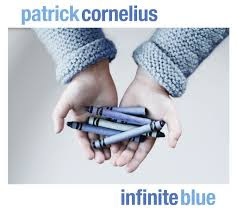 My upcoming album, Infinite Blue, is in many ways an extension of the melodic concepts from my last CD, Maybe Steps (REVIEWED HERE). I continue to be fascinated with the idea of telling stories through the melodic contours and collective ensemble colors. Every song I’ve written for Infinite Blue has a discrete story behind it, either from my personal experience or one that I’ve invented specifically for that tune. For the recording session, I needed musicians with a keen ability to accompany and improvise with an ear towards musical narrative. Pianist Frank Kimbrough is best known for the bespoke beauty that he creates within every single one of Maria Schneider’s gorgeous masterpieces for large ensemble. He brings an unparalleled finesse and the classiest brand of swing to the proceedings. Percussion master Jeff Ballard’s resume speaks for itself, but most specifically his work with Brad Mehldau and with his own band Fairgrounds affirm his mastery of storytelling with rhythm. Another goal for this recording was to bring together established, seasoned masters like Kimbrough and Ballard together with musicians of my generation. There is no other musician whom I’ve toured with more than London-based bassist Michael Janisch, whose unrelenting groove and musical palette provide the sonic foundation for the entire album. Trombonist Nick Vayenas and I have been close musical associates and collaborators since our days at Berklee College of Music together in the 90s. We’ve recorded 9 albums together, and have been artistic partners for 15 years. Florida native Mike Rodriguez is one of the leading trumpet virtuosos in New York right now. He earned his stripes playing with artists from Eric Reed to Charlie Hayden to Gonzalo Rubalcaba, and brings a beauty and grace to every project he works on. The idea for Infinite Blue came while I was flying from New York to Texas on a family trip, seated next to the window. I looked out into the clear blue expanse, and got an idea for a melody stuck in my head, and was able to jot it down in my composition notebook. When I got back home, and was able to flesh out the tune, my 3 year old daughter brought me her coloring book and a handful of crayons to play with alongside her. One of the crayons caught my eye. It was labeled “Cielo Infinito.” That’s when I knew I had the title to my project. Over the past week I’ve had the pleasure of touring this music around the UK with bassist Michael Janisch, guitar wizard Phil Robson, and drummers Andrew Bain and Shane Forbes (both incredible, in completely different ways), and the band has gotten better and better each night. After playing well over 100 concerts throughout Great Britain over the past 7 years, I've learned that the jazz audience here is among the most enthusiastic, knowledgable, and welcoming in the world, and I've had an absolute blast this past week. Our momentum has been building towards Monday night’s CD Release concert at the 606 Club in Chelsea, and the band should be really sizzling by then. For our final event of the tour, we’ll be showcasing the music from Infinite Blue, alongside a few choice classics from my back catalog. Please come out and join us! Infinite Blue is released worldwide on July 23rd.